Abstract: Through the advent of smartphones, the previously elusive internet is now available to each person right in their hands, with lightning fast speeds available at rather nominal charges. Mobile phones offer numerous solutions to dentists and health workers alike and can be applied in a variety of ways in a public health setting. This paper discusses the application of mobile phones in primary, as well as secondary and tertiary levels of intervention from a dental public health perspective. Indeed, the described strategies can be employed by professionals, alone or combined with other interventions, to enhance the oral health of their patients. Keywords: cell phones, dental public health, health promotion, oral health, prevention. The role of communication in the human health care sector is inescapable. It helps to convey the patient’s own experiences, values and preferences to the health care professional, all of which greatly influences a patient’s perception of the service, can create motivation for change, as well as augment subsequent compliance and adherence.1 This has led health care providers to constantly seek new, effective ways to reach “consumers” and promote their health through education, ultimately helping them manage their ailments. Overall, mobile phones have revolutionized the face of communication, and there is great potential for their use in health sectors. Patients and providers can now communicate from anywhere in order to follow-up on test results, ask questions, collect information, schedule appointments, send reminders and renew prescriptions. In a country like India, where the dentist population ratio is so skewed in favor of urban areas, many remote villages and localities severely lack dental health services.6 The absence of private dentists can only be countered by providing adequate oral health services at a primary health center or community health center. Deprofessionalization of dentistry has been regarded as a necessary evolution to combat the burgeoning morbidity due to oral diseases in rural areas, a problem that is only magnified by the ever-increasing population.7 Developing a system to remotely educate and aid health extension workers will greatly improve the quality of oral health care. Where other conventional delivery mechanisms fall short, mHealth is already being used to provide underserved populations with access to information and services. Mobile devices can easily be applied in a dental health setting to enhance patient outcomes.8 As practitioners of dental public health in a developing nation where there is both lack of oral health awareness and lack of services, the authors realized the need for alternative methods of oral health care delivery. It was observed that most patients possessed a mobile phone with internet capabilities, and were also interested in innovative technologies that could enhance their health. 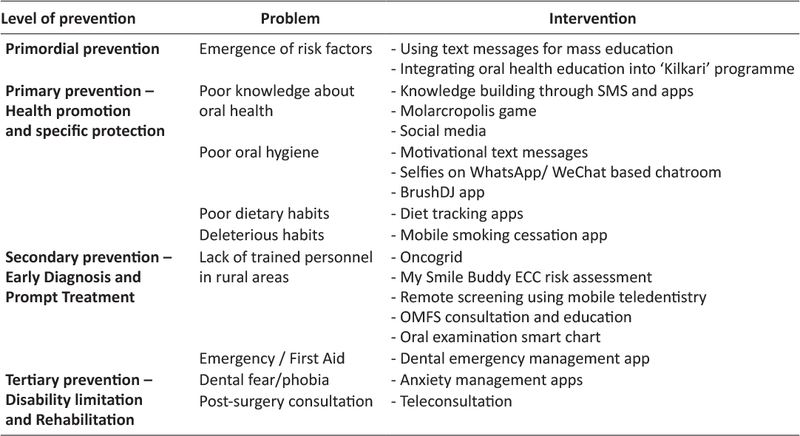 This inspired a search for mobile phone interventions in dental public health. A comprehensive knowledge of the purposes for which mobile phones have been used in healthcare in the past and an idea about their future utilization is necessary. Understanding the ‘Why?’, ‘What?’ and ‘How?’ of these interventions will enable public health workers to incorporate mHealth, an essential tool in this technology-oriented era, into dental public health practice. Researchers from all fields of science have attempted to incorporate the myriad features and technologies of mobile phones into health-care interventions. In the field of oral health, such interventions can be used in a variety of ways to enhance health outcomes. Dentists too are getting involved in this technological revolution. In a descriptive study by Jasti et el.,9 approximately 68% of the surveyed dentists from Khammam, Andhra Pradesh reported using healthcare apps on their smartphones for either personal knowledge or patient education purposes. In a Dental Public Health setting, mobile phones can be used for primordial, primary, secondary, as well as tertiary prevention. An attempt can also be made to bolster the oral health of the community by taking advantage of the Digital India Initiative by the Government of India. ‘Kilkari’ is one such scheme for information regarding maternal and child health, where pregnant women receive voice calls on a range of relevant topics.11 Integrating oral health education into this scheme will not just expand the latitude of the existing programme, but will also allow access to a key target population. Using SMS and mobile phone applications, oral health education can be provided at an individual and community level. When selecting apps for oral health education, it is necessary to select one that dispenses accurate information based on evidence. Software developed for this purpose usually allows patients learn about their disease, its prevention and necessary treatment, however, requires active participation. Smartphones can also utilize entertainment to dispense health education, such as Molarcropolis, a mobile persuasive to raise oral health and dental hygiene awareness for adolescents and young adults. Soler et al.12 evaluated the game and found that most of the participants found the game to be both entertaining and informative. Mobile social media platforms such as Facebook and Twitter can also be used to leverage social influence and bring attention to the importance of oral health. The Brush DJ app was developed to motivate patients to adopt an evidence-based oral hygiene behavior by playing music of the user’s choice. The app also reminds the user to spit and not rinse after brushing in order to maintain optimum local fluoride levels. Its competence was demonstrated by Underwood et al.16 who reported that 88% of app users were motivated to brush longer. Dental caries is another common dental disease, closely associated with diet, as has been proven by innumerable researchers.17,18 Tracking a patient’s diet is a commonly used method for caries risk assessment and also for assessing one’s general health behavior in routine practice. Although unexplored, this pivotal step of diet history can be simplified by making use of journaling applications such as Wellness Diary, Calorific, My Food Diary, Nutritionist etc. This comprehensive overview of the patient’s diet history can be shared with the dentist who can then formulate an appropriate treatment plan. To help patients quit harmful habits, public health dentists and primary care workers can provide habit counselling using mobile phones. An example of this is The Real E Quit Mobile smoking cessation application that helps people quit smoking with the aid of supportive audio clips and documents. Users can also make their own lists on reasons for quitting, benefits, and plans for challenging situations. Buller et al.19 found that 75% of users evaluated REQ-mobile to be user-friendly, and concluded that it was a feasible method for delivering cessation support to help people quit smoking. Oral cancer screening is based on the rationale that self-examination or oral check-up by a professional reduces the mortality due to this disease, and also leads to recognition in earlier stages. Birur et al.20 describe the use of Oncogrid, a mobile phone based remote oral cancer surveillance tool, connecting primary care dental professionals with frontline health workers (FHW). This telemedicine program found that oral cancer screening and surveillance via mobile phones was feasible even in remote areas and low-resource settings. The authors suggest that such interventions can cause a paradigm shift in the practice of public health. MySmileBuddy was developed by Levine et al.21 to reduce early childhood caries prevalence and its consequences amongst a high risk population. It allows community health workers or lay workers to conduct preliminary dietary screening assessment for high risk children and their mothers. After collecting information on the caries risk, the parents are informed of suitable behavior goals they can choose from so that the caries risk is diminished. The associated community health worker also follows up on the family to assess the progress towards behavior goals. With further research and adaptation, the use of mobile technology for dietary assessment may be applicable for widespread use in a variety of sites and programs that address the health needs of young children. The highly-advanced cameras available in current mobile phones also allow for remote screening for dental caries by mid-level dental providers, as demonstrated by Estai et al.22 They found that this method has a sensitivity ranging from 60-68%, and a specificity between 97-98%. This can help tackle some of the problems caused by the lack of dental services available to rural populations in countries like India. Additionally, it is now possible to advise even those who are furthest from dental treatment during an emergency. Stein et al.25 developed an extremely useful application for the purpose of triaging dental emergency. Their study demonstrated that patients can use their smartphones to transmit relevant clinical data to their dentists, all within 4 minutes. The authors suggested using mobile applications to enhance routine and emergency dental care. In primary and community health centers, dentists are often posted on a rotational basis due to the paucity of professionals. Therefore, a dentist may not always be available for post-surgery consultation. In the case of full-mouth rehabilitation cases, it takes quite some time for patients to get used to their new appearance and occlusion. To help patients rehabilitate, dental professionals and health workers can consult and counsel via mobile phones. For instance, myDentist is an app through which patients may explain their problems to the oral health care provider by sending text, diagrams or photos. The dentist can respond to these messages with appropriate instructions to manage the problem, and can also arrange an appointment for the future. Dental phobia is a crippling disorder causing an individual to avoid dental treatment because of an irrational fear, even if they are in pain. In the process of avoiding the dentist, the disease progresses and may lead to severe disability. To limit this disability caused by dental diseases, elimination of dental phobia is necessary, after which patients can utilize the services available to them. Applications like Dental Phobia claim to reduce a patient’s anxiety towards dental treatment through hypnosis. Such means of handling dental phobia must be critically reviewed before wider application; research must be conducted in this field in the future. One of the primary restraints of mHealth is that not all interventions can be readily applied to the myriad segments of the population. It must be kept in mind that the ability to read the information may be lacking in many mobile phone users due to low literacy rates; approximately 15% of the adult population was considered to be illiterate in 2010. Moreover, as per World Bank estimates, at least thirteen developing nations have a literacy rate of less than 50%.26 In such conditions, a text-based intervention may fail, while image-based interventions can succeed. Complicated and cumbersome technology may hinder, rather than assist the user, especially if the procedure involves too many steps. Another limitation is that the cost-effectiveness of internet-based mobile phone interventions has not been established. Depending on the network carrier and data usage, charges can vary from user to user. One more feature that varies with network carrier is the range. Although there has been staggering growth, there are certain areas that are still untouched by this technology. Additionally, Tatum et al.27 have proposed that cortical processing in the human brain is uniquely activated by the use of personal electronic devices such as mobile phones. However, the practical and real-world implications are yet to be studied. Finally, it is worth mentioning that there is a paucity of comparative studies regarding mobile phone interventions in dentistry. Therefore, it is not possible at this time to conclude on the relative value of each intervention. It is necessary to conduct rigorous investigation to assess the same. Like fire and the wheel, the invention of mobile phones changed the lives of humans worldwide, and like most inventions, they are in a process of constant improvement. Healthcare professionals have recognized the impact this has had on the lives of their patients, and have adopted cellphones in a variety of ways. Oral health care providers can implement mHealth interventions in public health practice at all levels of prevention. Indeed, one, or a combination of these strategies can be employed by health workers to enhance the oral health of their patients. Moreover, mobile phones are an accessible, affordable, appropriate technology for interventions in a public health setting. By focusing on prevention and involving the community in these programs, dental professionals can give a much-needed boost to the oral health status of people. There are unparalleled advantages to using mobile devices that cannot be matched by other technological media. However, the potential complications should be kept in mind. Dentists should take initiative and be involved in the planning of guidelines for these interventions. Declaration: The matter presented in this paper or any part of it is has not been submitted elsewhere simultaneously. The authors certify that they have no potential conflict of interest, financial or otherwise, pertaining to the information discussed in this paper. All the matter presented in this paper has been read and approved by all the authors. Criteria for inclusion in author’s list: Dr. Aditi Hegde was involved in the conception, literature review, compilation and writing of the paper. Dr. Gopikrishna V took part in the conception of the study and writing of the paper. Dr. Smitha B Kulkarni took part in writing the paper. Dr. Nithin N Bhaskar supervised the literature review, and took part in the writing of the paper. Dr. Sourabha K G participated in literature review and paper writing. Dr. Jeswin Jacob participated in the study conception and writing of the paper. All authors have provided valuable inputs to the manuscript, agree with its contents, and have approved the final manuscript. The literature search was performed using an electronic database search of peer-reviewed bibliographic and non-bibliographic databases, as well as a review of websites of reliable institutions. Medical Subject Headings (MeSH terms) were used wherever possible to ensure a uniform search strategy. Each term was used as a single item or in combination by employing the Boolean operators “AND” and “OR”. The following terms were used: teledentistry, mHealth, mobile phone, mobile health, cell phone, texting, message, text message, mobile application, SMS, dentistry, dental health, dental public health, public health dentistry, oral health. The studies that were not directed towards oral or dental health were excluded. All included studies focused on the prevention and control of oral diseases, collection and transmission of oral disease information, and training of health workers. 1. Ang WC, Swain N, Gale C. Evaluating communication in healthcare: Systematic review and analysis of suitable communication scales. J Commun Healthc 2013;6(4):216–22. 2. Ni Z, Wu B, Samples C, et al. Mobile Technology for Health Care in Rural China. Int J Nurs Sci 2014;1(3):323–4. 3. Deribe K, Roda AA. The potential of mobile phone technology for public health practice in Ethiopia. Ethiop J Health Dev 2012;25(3):233–4. 5. Petersen PE. The World Oral Health Report 2003: continuous improvement of oral health in the 21st century–the approach of the WHO Global Oral Health Programme. Community Dent Oral Epidemiol 2003;31(S1):3–24. 6. Yadav S, Rawal G. The current status of dental graduates in India. Pan Afr Med J 2016;23:22. doi:10.11604/pamj.2016.23.22.7381. 7. Reddy KV, Moon NJ, Reddy KE, et al. Time to implement national oral health policy in India. Indian J Public Health 2014;58:267–9. 8. Mustaza TA, Lim TW, Ghani A, et al. Mobile applications at the dentist. International Journal on E-Learning and Higher Education 2016;4:16–28. 9. Jasti D, Pratap KVNR, Padma MT, et al. Health care apps- will they be a facelift for today’s medical/dental practice? J Mob Technol Med 2015;4(1):8–14. 10. Telecom Regulatory Authority of India. Highlights of Telecom Subscription Data as on 30th June, 2015. Press Release no. 47/2015. New Delhi: Telecom Regulatory Authority of India; 2015. 12. Soler C, Zacarías A, Lucero A. Molarcropolis: a mobile persuasive game to raise oral health and dental hygiene awareness. International Conference on Advances in Computer Entertainment Technology. New York: The Association for Computing Machinery; 2009. p. 388–91. 13. Schluter P, Lee M, Hamilton G, et al. Keep on brushing: a longitudinal study of motivational text messaging in young adults aged 18–24 years receiving Work and Income Support. J Public Health Dent 2015;75:118–25. 14. Zotti F, Dalessandri D, Salgarello S, et al. Usefulness of an app in improving oral hygiene compliance in adolescent orthodontic patients. Angle Orthod 2015;86(1):101–7. 15. Li X, Xu ZR, Tang N, et al. Effect of intervention using a messaging app on compliance and duration of treatment in orthodontic patients. Clin Oral Investig 2016;20(8):1849–59. 16. Underwood B, Birdsall J, Kay E. The use of a mobile app to motivate evidence-based oral hygiene behaviour. Br Dent J 2015;219(4):E2. doi: 10.1038/sj.bdj.2015.660. 17. Nikiforuk G. Understanding Dental Caries. Vol. 1: Etiology and Mechanisms. Basel: Karger; 1985. 18. Hujoel PP, Lingström P. Nutrition, dental caries and periodontal disease: a narrative review. J Clin Periodontol 2017;44(S18):S79–S84. 19. Buller DB, Borland R, Bettinghaus EP, et al. Randomized trial of a smartphone mobile application compared to text messaging to support smoking cessation. Telemed J E-Health 2014;20(3):206–14. 20. Birur PN, Sunny SP, Jena S, et al. Mobile health application for remote oral cancer surveillance. J Am Dent Assoc 2015;146(12):886–94. 21. Levine J, Wolf R, Chin C, et al. MySmileBuddy: An iPad-based interactive program to assess dietary risk for early childhood caries. J Acad Nutr Diet 2012;112(10):1539–42. 22. Estai M, Kanagasingam Y, Huang B, et al. The efficacy of remote screening for dental caries by mid-level dental providers using a mobile teledentistry model. Community Dent Oral Epidemiol 2016;44(5):435–41. 23. Aziz SR, Ziccardi VB. Telemedicine Using Smartphones for Oral and Maxillofacial Surgery Consultation, Communication, and Treatment Planning. J Oral Maxillofac Surg 2009;67:2505–9. 24. Payne KF, Goodson AM, Ahmed N, et al. Developing a smartphone application to improve access to quick-reference educational resources: the oral and maxillofacial surgery experience. Bulletin of the Royal College of Surgeons of England 2013;95(2):62–79. 25. Stein CD, Xiao X, Levine S, et al. A prototype mobile application for triaging dental emergencies J Am Dent Assoc 2016;147(10):782–791.e1. doi: 10.1016/j.adaj.2016.03.021. 27. Tatum WO, Di Ciaccio B, Yelvington KH. Cortical processing during smartphone text messaging. Epilepsy Behav 2016;59:117–21.